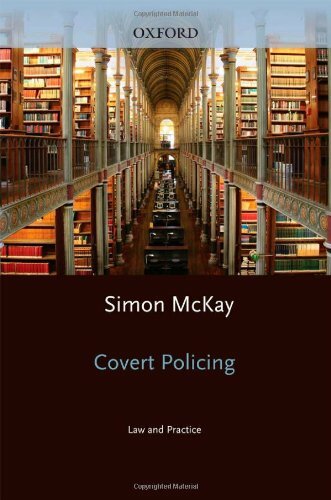 Covert Policing: Law & Practice offers a comprehensive review of the law governing covert policing activities, undertaken by law enforcement and other public authorities. It sets out the framework within which covert policing operations should be planned and managed to enable practitioners working for either the defence or prosecution to consider the legality and propriety of evidence obtained in cases where covert policing resources have been deployed, including applications for Public Interest Immunity. The text places considerable emphasis on the need for a proper methodology of approach to RIPA 2000 and other legislation affecting this area, including the 2010 revised Codes of Practice on Covert Surveillance and Property Interference and the Use and Conduct of Covert Human Intelligence Sources. It examines the statutory and procedural requirements relating to covert policing deployments, from the interception of communications and directed and intrusive surveillance resources, through to the use and conduct of covert human intelligence sources in operations as diverse as counter-terrorism and serious crime to minor test purchase cases. Covert Policing: Law & Practice critically assesses the law in this area and identifies vulnerabilities and anomalies which practitioners need to develop and use during the course of legal arguments. It will also examine the oversight mechanisms that exist to protect those subjected to invasions of privacy without the proper criminal or civil processes. The law in this area is notoriously complicated and opaque. Covert Policing: Law & Practice seeks to unravel the complexities of RIPA and its relationship with other legislative provisions in order to assist those working in the area. Written in a way that seeks to highlight the effect of the legislation and the principles emanating out of the case law, this book is an essential resource for practitioners engaged in cases where covert policing issues are likely to arise. It will also be of assistance to those working ofr the police and other public authorities authorised under the Regulation of Investigstory Powers Act 2000 to carry out surveillance and other covert activities.